Connect the natural sciences, geography, mathematics, and other fields to fully explore some of the most important issues facing scientists and society today. 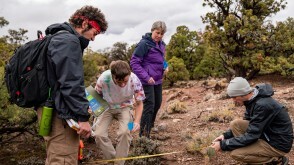 Once you've taken your core classes, you can explore the environment through upper-level natural science courses in a wide range of disciplines. You'll gain a whole-organism focus with courses that will prepare you for graduate studies in science. And every major will complete a capstone project. We emphasize intellectual curiosity, creativity, initiative, and synthesis, and all Environmental Science majors are encouraged to participate in mentored research projects or internships. Katie Vonderembse '19 used mapping software to display the distribution of a flowering plant called Xylopia. These maps offer a better understanding of the evolution and classification of the genus, and will help in the development of conservation plans. 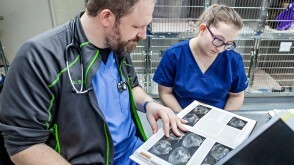 Professors David Johnson and Nancy Murray served as her mentors. 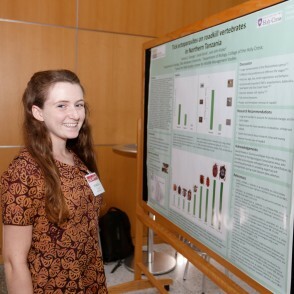 Callie Angelo '20 participated in the Summer Science Research Program, where she studied immune responses of nesting House Wrens with a limited energy supply. Luke Steffen '16 participated in the 10-week Summer Science Research Program to study the invasive garlic mustard plant and the impact of the nation’s dying ash trees. 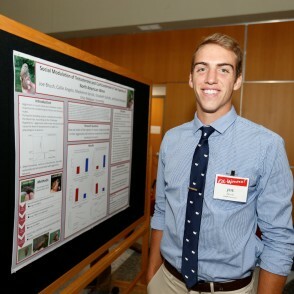 Joe Brush '20 participated in the Summer Science Research program, where he studied aggression in two different male songbird species with Drs. Dustin Reichard and Elizabeth Schultz. 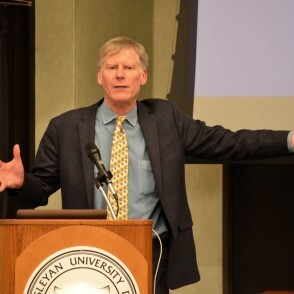 Jonathan Overpeck, a 2007 Nobel Prize winner, visited OWU to discuss global climate change for the 2019 Eddy Lecture on World Politics. Travel-Learning Courses combine classroom study with travel to areas of the world where you may study the issues discussed in class in the settings where those events are occurring. 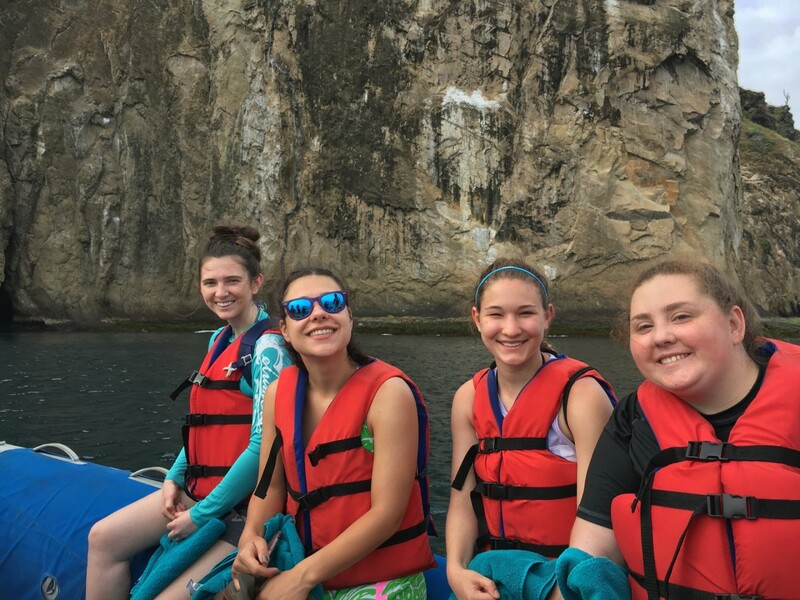 Recent Travel-Learning Courses have explored environmental topics in Brazil, Costa Rica, and the Galapagos Islands. 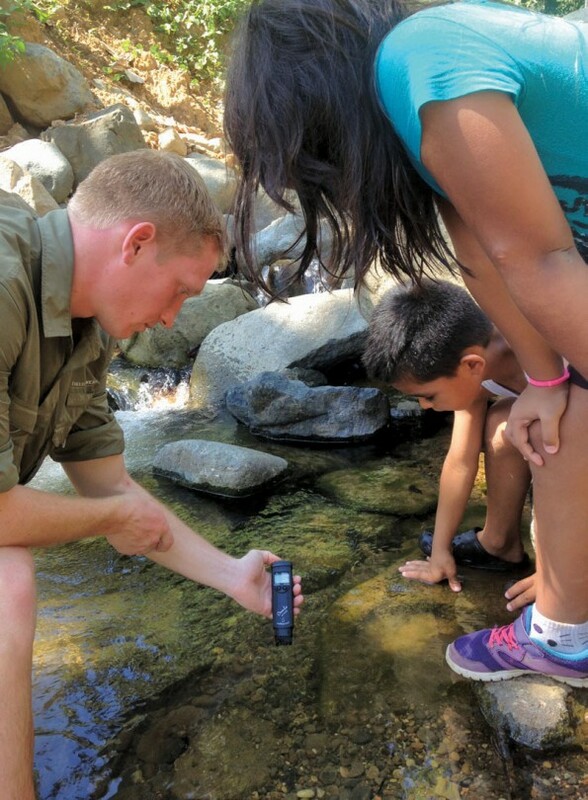 Theory-to-Practice Grants give students the opportunity to research environmental topics in the field anywhere in the world. 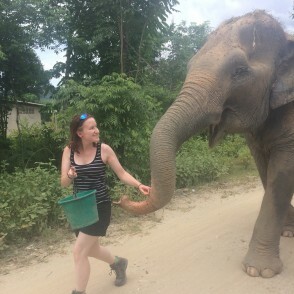 With a Theory-to-Practice Grant, Izzy Sommerdorf '18 spent the summer of 2017 volunteering with Wildlife Friends Foundation in Thailand. 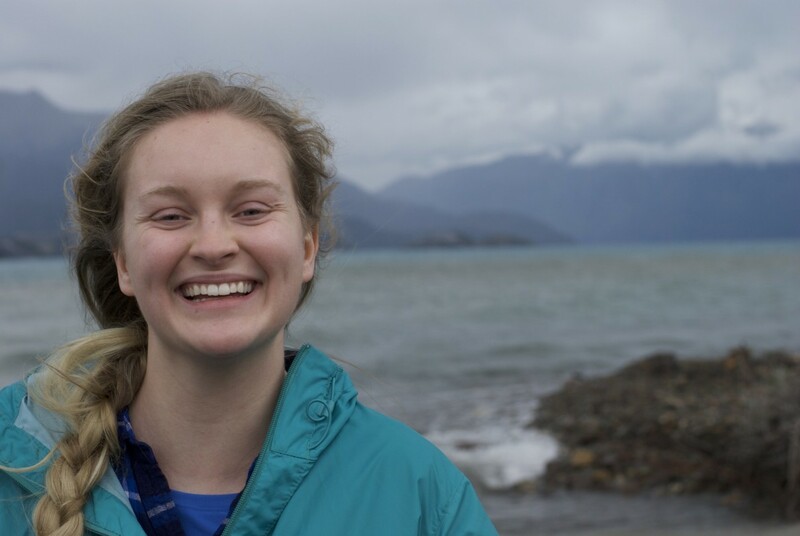 Haley Talbot-Wendlandt '18 has traveled many times through The OWU Connection, from a Travel-Learning Course to study sustainable tourism in Costa Rica, to a Theory-to-Practice Grant to study climate change in Iceland, to a geology Travel-Learning Course to Death Valley. 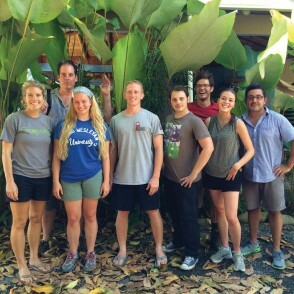 An Ohio Wesleyan alumna, professors, and students in a Travel-Learning Course teamed up to use high-tech geography in Costa Rica to help preserve a rich and wonderful ecosystem. 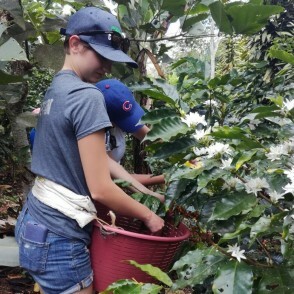 Ashley McCracken '19 studied sustainability in local industries while on a Travel-Learning Course to Costa Rica in Winter 2017. Build your experience and connections to the professional world with internships and research projects at environmental organizations and other universities. 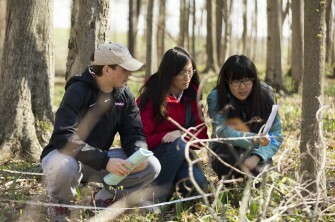 Environmental Science students also can apply for University-funded OWU Connection Grants for research projects around the world. 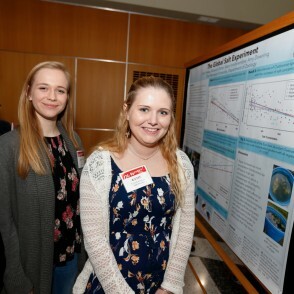 Rebecca Poter '20 (left) and Katie Vonderembse '19 (right), along with Colin Hawes (not pictured) participated in the 2018 Summer Science Research Program with Dr. Amy Downing. They researched the effects of de-icing road salts on bodies of water with high quantities of microscopic organisms. 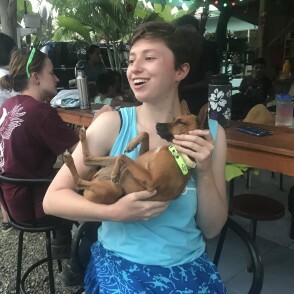 Eva Blockstein '19 spent eight weeks volunteering at the Panama Amphibian Rescue and Conservation Center, where she studied spindly leg syndrome in endangered frog species with Brian Gratwicke, Ph.D. 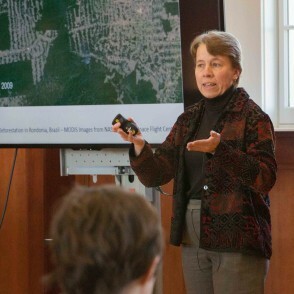 Her research was funded by an OWU Theory-to-Practice Grant. Serena George '19 spent a semester researching ectoparasites found on ticks in Northern Tanzania. 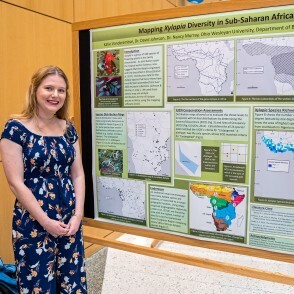 She conducted her research as part of a project at the School for Field Studies Center for Wildlife Management Studies, where she studied abroad. Her research helps show what tick-borne diseases people living in Northern Tanzania may be at risk for. 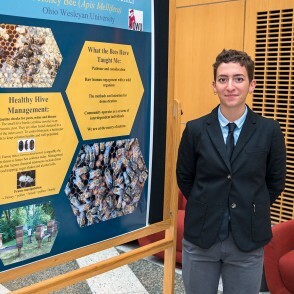 Peyton Hardesty '20 spent the summer of 2017 working as an apprentice for Dave Noble, the Head Apiarist at Stratford Ecological Center in Delaware, Ohio. 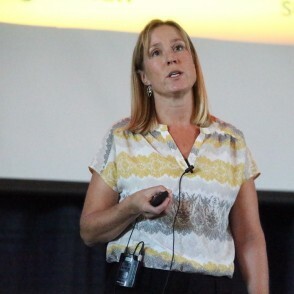 Hardesty studied healthy beekeeping methods and prevention techniques for Colony Collapse Disorder (CCD). The Kraus preserve is 80 acres and the Bohannan preserve is 54 acres. Students and faculty use them as outdoor labs and for for research. 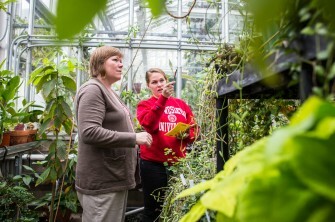 OWU’s greenhouse has tropical and desert rooms available for students. The greenhouse is used for teaching classes, and you can use it for independent research. You can apply to participate in the Summer Science Program where you research with fellow students and faculty for 10 weeks. 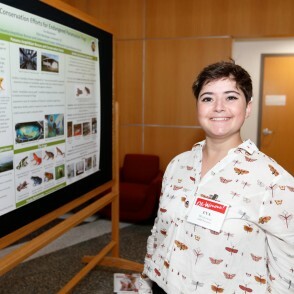 You then present your research at the Patricia Belt Conrades Summer Science Research Symposium in the fall. 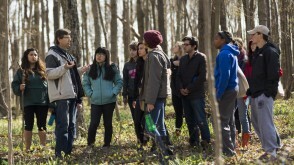 In a unique "conversations" class, graduating seniors serve as mentors to all new Environmental Science majors. They help guide new students to shape their plans for future work in their major. 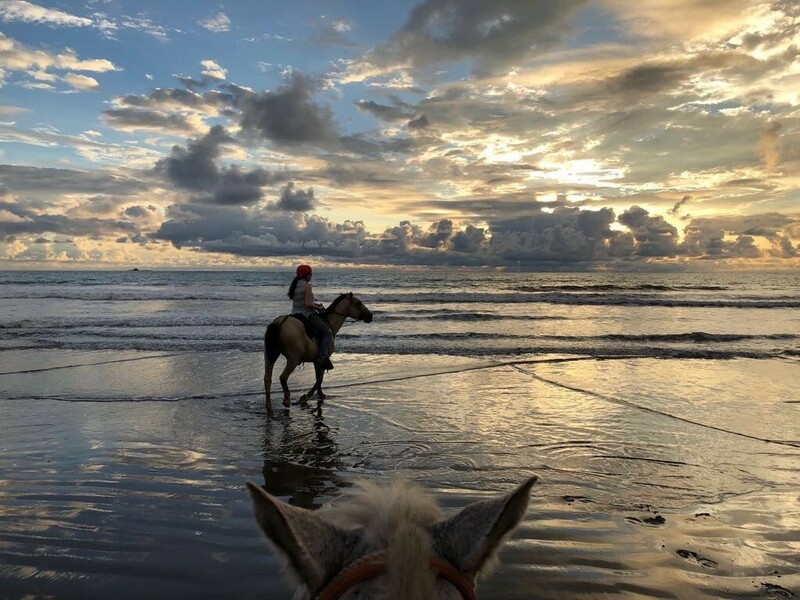 Amy is program director with Geoporter in Bahia Ballena-Uvita, Costa Rica, where she is using GIS technology to help the village transition from a farming-and-fishing economy to a tourism economy. 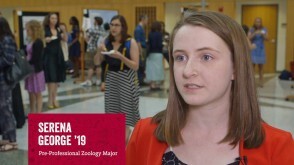 In the past few years, OWU graduating seniors have moved on to environment-related jobs at American Environmental Group, Audubon Zoo, Columbus Zoo & Aquarium, Coyote Trails School of Nature, and Resource One. 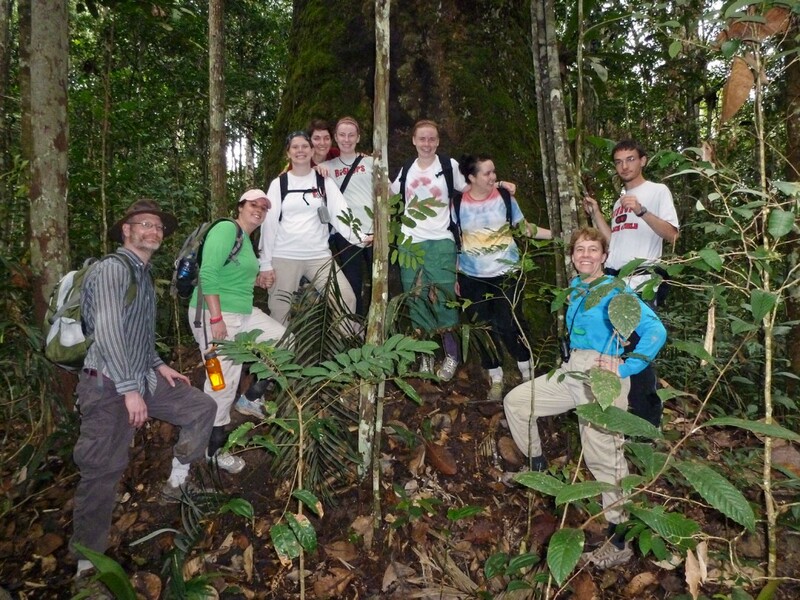 Environmental Science graduates often continue their studies in graduate school. 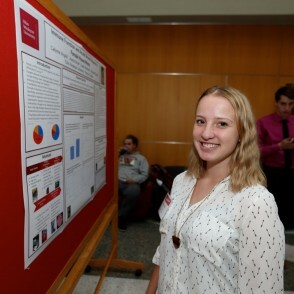 Recent OWU science graduates have studied at Arizona State, Boston University, Dartmouth, Duke, Ohio State, Penn State, University of California Davis, Yale, and more. After graduation, Sarah Jilbert '14 earned an MBA from Duquesne University focused on Environmental Sustainability. She now works as a Sustainability Analyst for DHL Supply Chain in Westerville, Ohio. 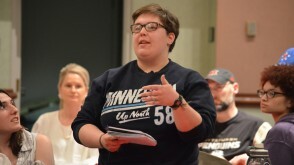 Rebecca Heisman '09 earned an MS in Environmental Education and Interpretation from University of Wisconsin-Stevens Point. She now works as an Environmental Writer and Communications Specialist in Walla Walla, Washington. 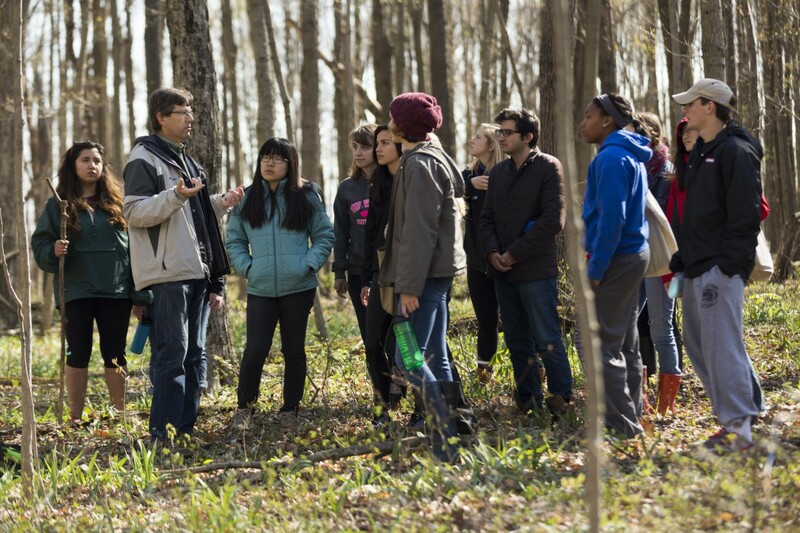 Dr. David Johnson leads a class at one of OWU's nature preserves. 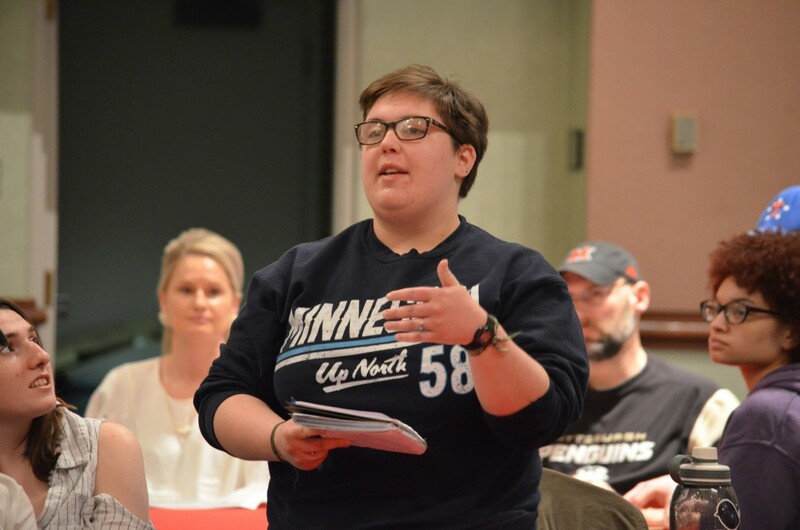 Environmental Science student Kait Aromy '20 asks Nobel Prize winner Jonathan Overpeck a question during the 2019 Eddy Lecture on World Politics. 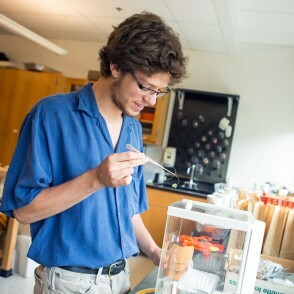 Michael Durfee '17 performs water quality research. 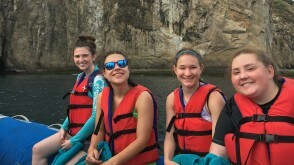 Serena George '19 describes her research on the basilisk from a Travel-Learning Course. 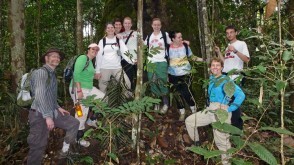 Travel-Learning Course on the rain forest environment. 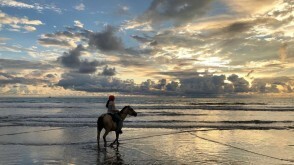 Students on Dr. Amador-Rowley's Environmental Alterations Travel-Learning Course end the day horseback riding on a beach. 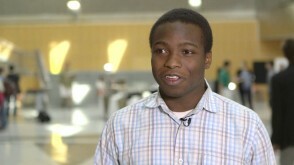 Jordan Brown '18 discusses research he performed as a first-year OWU student. 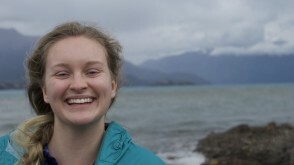 Olivia Lease '17 studied preservation and privatization of nature in Patagonia with a Theory-to-Practice Grant. She currently works for Americorps in Florida.